The Ann Arbor 4 Piece Sectional is the perfect seating set for your outdoor living space. The modular design allows you to add additional pieces if you wish. The sectionals 2-step aluminum frame and weather resistant wicker work together to create the perfect, modern look! Relax with the cozy CorLiving Park Terrace Collection this summer. The PPT-341-M armless middle seat extends the sectional set in either direction joining the corner PPT-341-L seat to the PPT-341-O ottoman. The textured black resin rattan weave is complimented by high quality, weather resistant foam seat cushions wrapped in zippered and washable teal covers. Ready to use upon delivery, you can complete your summer patio set with this comfortable seat from CorLiving. Ann Arbor 4-Piece Patio Sectional Set The Ann Arbor 4 Piece Sectional is the perfect seating set for your outdoor living space. The modular design allows you to add additional pieces if you wish. 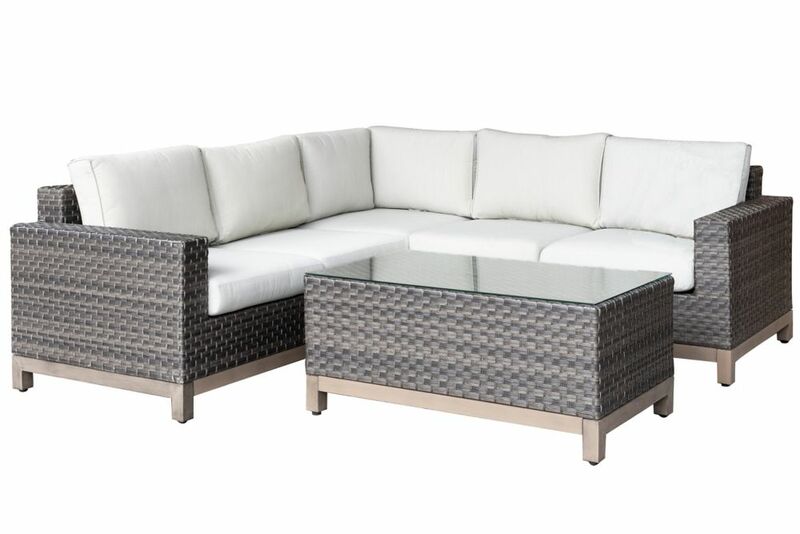 The sectionals 2-step aluminum frame and weather resistant wicker work together to create the perfect, modern look! Ann Arbor 4-Piece Patio Sectional Set is rated 5.0 out of 5 by 2. Rated 5 out of 5 by Ginny from Great quality and value We bought this for the backyard and ordered it online. The product came on time and The Home Depot sent several messages to let me know when it will arrive. The sofa is well made and the double powder coating is great for Canadian Winters. I did not see any other sofas with this feature under $2000. It looks great! Rated 5 out of 5 by tcproad from Beauty and Comfort!! Bought this set in store after sitting on it and it is incredibly comfortable and looks AMAZING! The only tricky part with putting it together is the stupid Allen key that you need to use...but didn't take long to get together! Absolutely LOVE this set! is the frame from aluminum or steal? Thank-you for your interest in the Ann Arbor 4 Pc Patio Sectional. The cushions are beige and the frame is brown/wicker. If you have any further questions or concerns please contact us at info@partsnservice.com Please note that we have an Ann Arbor Woven Chair, Armless Chair and firepit that compliment this sectional. What is the height without the cushions? What is the thickness of the cushions? This set includes 2 loveseats, corner section and coffee table. Additional pieces to compliment this set is the 1000848555 Ann Arbor Armless Chair and the 1000848556 Ann Arbor Woven Club Chair. which has the best bang! &nbsp;Ann Arbor or Sonax?